The Global Volcanism Program has no activity reports for Prestahnúkur. The Global Volcanism Program has no Weekly Reports available for Prestahnúkur. The Global Volcanism Program has no Bulletin Reports available for Prestahnúkur. The massive subglacial Prestahnúkur volcano at the SW end of the Langjökull icecap has associated rift zones to the north and SW that have erupted during the Holocene. Hot springs are associated with the rhyolitic central volcano. The classic Icelandic shield volcano Skjaldbreidur was formed at the southern end of this volcanic system, between Thorsjökull glacier and Thingvallavatn lake. The broad, low-angle shield volcano produced more than 13 km3 of basaltic lava flows during the early Holocene. 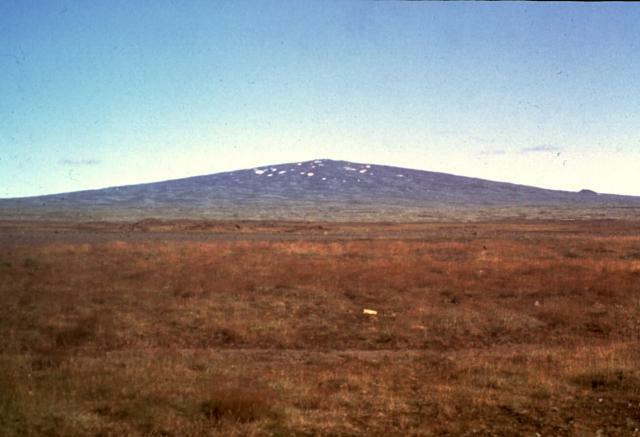 The smaller mid-Holocene Sköflungur lava shield lies immediately NE of Skjaldbreidur. Piper J D A, 1973. Volcanic history and tectonics of the North Langjokull region central Iceland. Can J Earth Sci, 10: 164-179. Saemundsson K, 1992. Geology of the Thingvallavatn area. Oikos, 64: 40-68. There is no Deformation History data available for Prestahnúkur. There is no Emissions History data available for Prestahnúkur. The massive subglacial Prestahnukur volcano at the SW end of the Langjökull icecap has associated rift zones to the north and SW that have erupted during the Holocene. 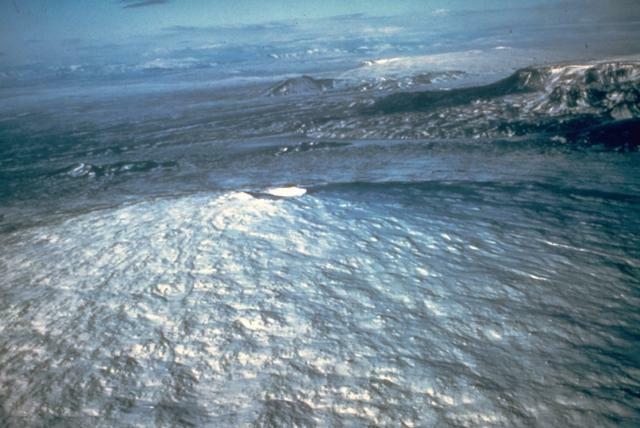 The classic Icelandic shield volcano Skjaldbreidur (seen in this photo) was formed at the southern end of the Prestahnukur volcanic system, between Thorsjökull glacier and Thingvallavatn lake. The broad, low-angle shield volcano produced 17 cu km of basaltic lava flows during the early Holocene. Hot springs are associated with the rhyolitic Prestahnukur central volcano. Photo by Ingibjörg Kaldal (Orkustofunun, courtesy of Richie Williams, U.S. Geological Survey). The classic Icelandic volcano Skjaldbreidur is perhaps the best known of the many small shield volcanoes that were constructed along rift zones where the Mid-Atlantic Ridge rises above sea level. Skjaldbreidur, seen here from the west along route 52, was formed about 9500 years ago during a single long-duration eruption at the southern end of the Prestahnukur volcanic system in central Iceland. The broad, low-angle shield volcano produced 17 cu km of basaltic lava flows and is capped by a small 300-m-wide summit crater. The Global Volcanism Program has no maps available for Prestahnúkur. Catalogue of Icelandic Volcanoes (Link to Prestahnúkur) The Catalogue of Icelandic Volcanoes is an interactive, web-based tool, containing information on volcanic systems that belong to the active volcanic zones of Iceland. It is a collaboration of the Icelandic Meteorological Office (the state volcano observatory), the Institute of Earth Sciences at the University of Iceland, and the Civil Protection Department of the National Commissioner of the Iceland Police, with contributions from a large number of specialists in Iceland and elsewhere. This official publication is intended to serve as an accurate and up-to-date source of information about active volcanoes in Iceland and their characteristics. The Catalogue forms a part of an integrated volcanic risk assessment project in Iceland GOSVÁ (commenced in 2012), as well as being part of the effort of FUTUREVOLC (2012-2016) on establishing an Icelandic volcano supersite. Large Eruptions of Prestahnúkur Information about large Quaternary eruptions (VEI >= 4) is cataloged in the Large Magnitude Explosive Volcanic Eruptions (LaMEVE) database of the Volcano Global Risk Identification and Analysis Project (VOGRIPA).